If I get to meet locals while travelling then it is usually a sign of an awesome trip. To travel and meet people who I can talk to about what a destination is really like for the people who live there is one of my favourite parts of travelling – I love to really get to know something about a culture that the average visitor wouldn’t find out. 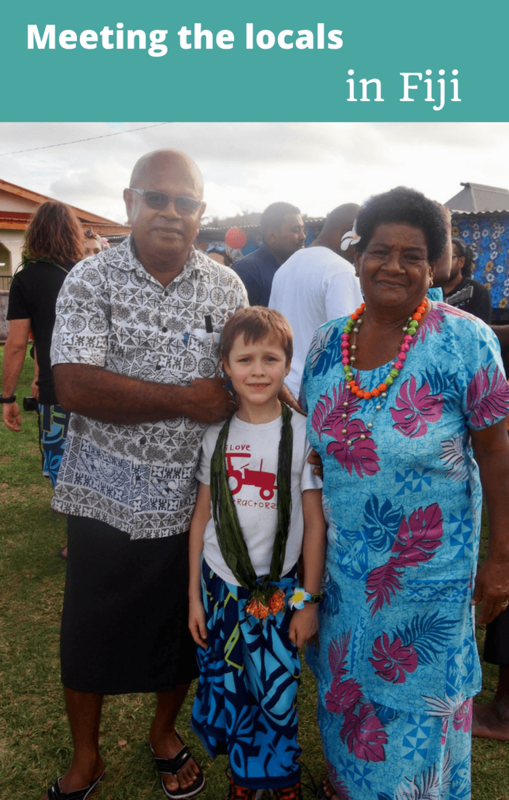 On our recent trip to Fiji with Hands On Journeys we got to spend a significant amount of time with local Fijians and it absolutely made the trip for me. Before we even landed in Fiji we were told that things operate on “Fiji time” – in other words, things happen when they happen, we shouldn’t expect German-style punctuality! – and that the greeting “Bula!” was one we would soon be saying hundreds of times a day. Honestly, I thought we were just told this as a bit of cultural fun, but both things turned out to be very important parts of Fijian culture. But that was just the start and on our day out to visit the village of Nailaga, where Hands On Journeys has been running an empowerment tourism project, we got to learn a whole lot more about the culture of Fiji. On the bus before we arrived, our Fijian guides explained how the welcome ceremony would progress – it would be all in Fijian so I was happy later that they’d explained what it was all about. We also practised the right ritual for receiving our bowl of kava, with clapping a certain way and a certain number of times. 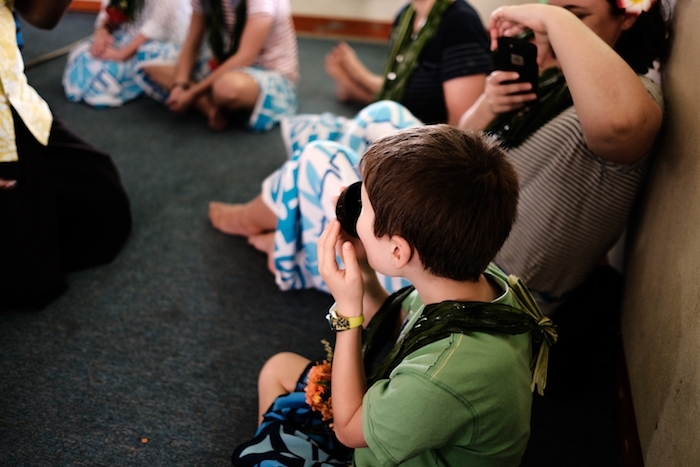 And finally, we learnt how to tie a sula – the Fijian version of a sarong – which we’d be wearing when we went to the village. 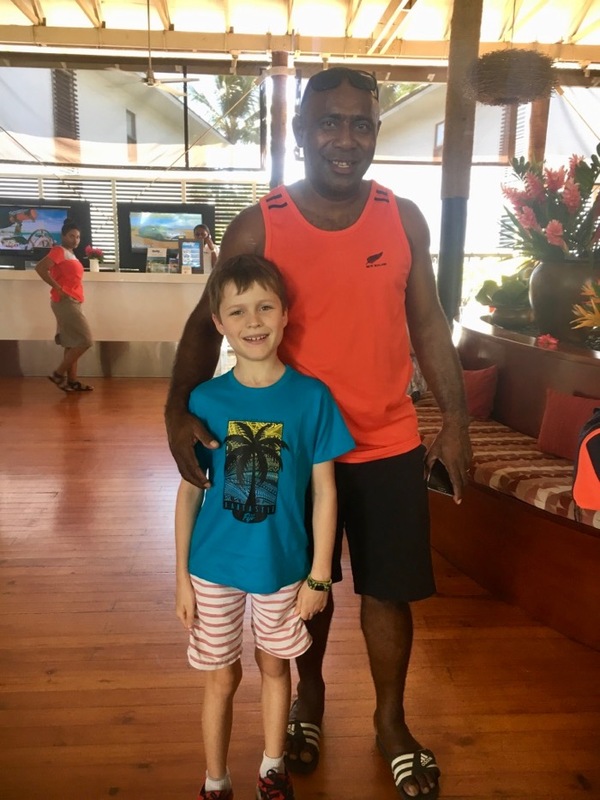 While some of our group went on to learn how to make the traditional Fijian foods we would later eat for lunch, and others continued chatting to the men who had led the kava ceremony, my son and I went to meet the kids who had come along for the day, mostly children of the women running the cooking class. 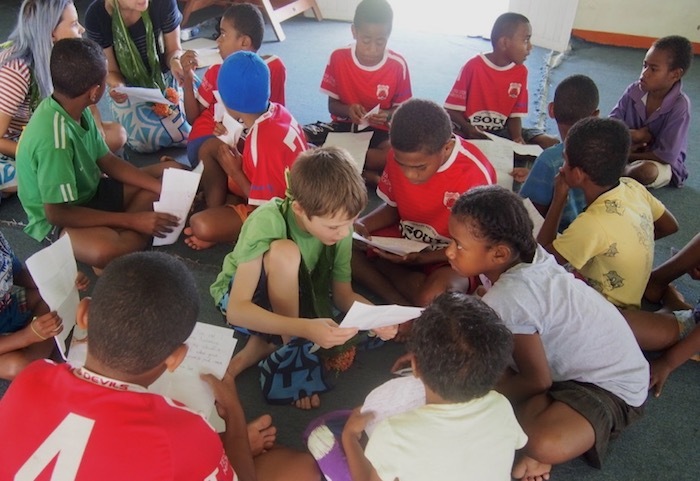 Back in Perth, my son’s teacher had got his class to write letters to the Fijian kids, so my son handed these out, helped some of the younger kids read them (any of the kids about ten or over could confidently read English well), and then they all sat together to write letters and draw pictures for my son to take back to his classmates. Both my son and I got to chat with lots of the kids and that chance for my son to be making friends while travelling was something I found so special. Afterwards, we also got to see the letters they were sending back to my son’s classmates and it was such a great cultural exchange to see what they said, and to see that although where they lived looked really different from where we do, a lot of things in their lives were very similar. Lots of the kids wrote about their favourite foods – often chicken and chips, like many Australian kids! – though some were a bit more local and named their favourite meals as “chicken palau” and “rice curry chicken”. They also wrote about their pet dogs and pet cats, and that they loved playing football and netball, just like my son’s classmates. I think for both my son and I the biggest reminder here was that even when circumstances are different – and even if income levels are wildly different – a lot of life can be really just the same. We also learnt more about the local experiences of current events – one fourteen-year-old wrote “usually it’s always hot but I guess because of climate change we’re kinda experiencing rain and floods a lot”. Often if I meet people while travelling, they are either fellow travellers, or they are locals who have worked in the tourism industry for years and are used to talking about the things they think tourists want to talk about. But visiting a village like Nailaga which had barely any experience with tourists was so much more interesting. Just by wandering the village throughout the day, we got to chat and meet lots of people. Being a Saturday, many people were around and there’d been quite a major vehicle accident overnight which meant ten more people were out and about. A container truck carrying shipping containers full of bottles of Fiji Water, apparently, had rolled over on the main road right at the village, and it caused a kind of casual chaos throughout the day – when we drove down to the Ba River to swim and look for mussels for lunch, for example, we had to follow a long line of vehicles through an off-road detour, and later we saw they had a crane to lift the fallen containers – it was handled differently to how it would have been in Australia but was an interesting insight into local life. We also walked past the chief’s house, and later we were told that the previous chief was a woman, she had passed away last year (and we were shown which was her burial spot, next to the house) and they hadn’t yet appointed the next chief. 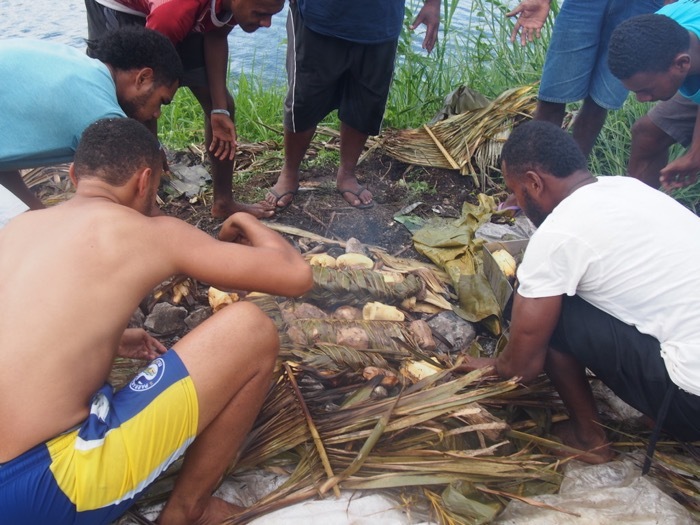 I asked one of the elders when that would happen but it seemed to be an ongoing process – seven tribes make up that village, so I guess decision-making can be slow – or perhaps it is all just happening on “Fiji time”. Meanwhile, I was impressed that the previous chief had been a woman (more about that in my podcast episode about Fiji!). As well as the locals we met at the village on our excursion that day, I can’t write about how to meet locals while travelling without mentioning our awesome local guides. The Hands On Journeys ethos means they find and train really fantastic locals to run the tours – often not people who have been tour guides before – and makes sure they are completely involved with all aspects of the tour. This impressed me no end – even in Japan, I’ve had the situation where our guide stays at cheaper accommodation, but I loved that our guides were always nearby, and from the very first morning, greeted us at breakfast and chatted with us. I’ve often wondered about how to meet locals when travelling. One of my favourite ways is to travel and stay with locals – whether that’s the kind of homestay arrangement I loved in Russia, or more commonly, going to stay with people around the world who are friends I’ve made while travelling or working abroad, or are friends from home who’ve moved interstate or overseas. It’s not always easy to meet people travelling, but after this reminder in Fiji of how rewarding it is, I’m going to be even more proactive about finding ways to travel and meet people, and get a better sense of what life is really like in the country I’m travelling through. Have you got some great ways to get to know local people when you travel? Let me know your secrets and tips! Ah hiking trails and being outside is a good way to strike up a conversation, I can imagine. I must try that too! And yes – while being a tourist can be plenty of fun too this was a really special experience.